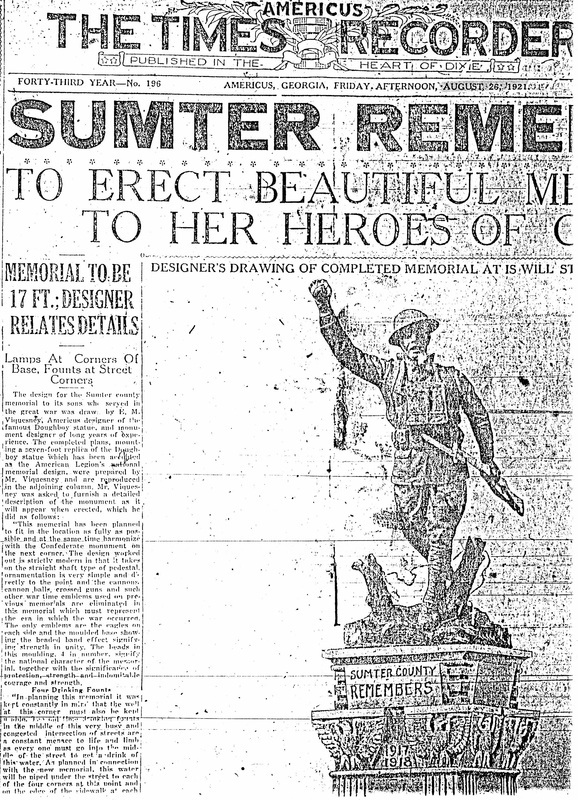 When his "Spirit of the American Doughboy" was first reported in the Americus, Georgia Times Recorder, Viquesney's fame quickly spread nationwide. 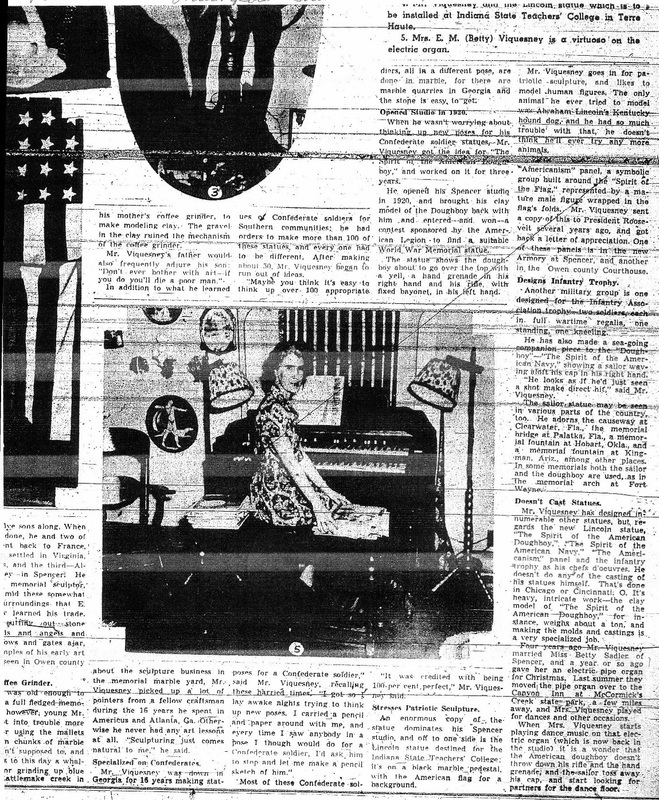 The article on the right mentions the planned installation at Centralia, Washington, which, because of an embarrassing turn of events, never occurred. Instead, another statue, "The Sentinel", by sculptor Alonzo Victory Lewis, was placed there in 1924. 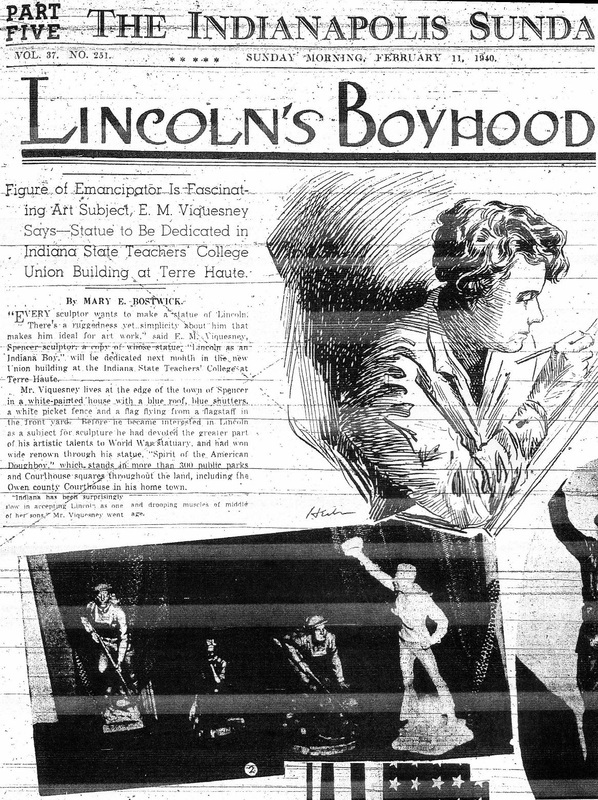 On February 11, 1940, the Indianapolis Sunday Star went to great lengths to cover the scheduled installation of Viquesney's "Lincoln as an Indiana Boy", giving the story a two-page spread. 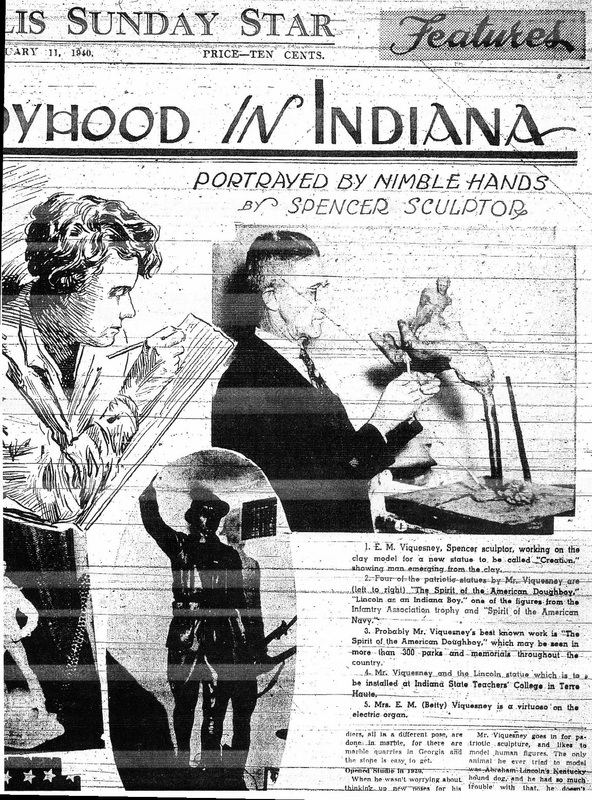 The 27-inch sculpture was supposed to be installed in the Union Building on the campus of then Indiana State Teachers' College (now Indiana State University) on March 18, 1940. But the statue was never installed, and nobody knows what happened to it. Inquiries to the University and contacts in Indiana have been unable to turn up anything. An old photograph shows T. Perry Wesley and associate Jess McKay in front of a collection of Viquesney items meant for a planned museum in Spencer, Indiana. The large version of the Lincoln statue can be seen in the photo. Whether this was the same sculpture that was meant for Indiana State U. is not known. 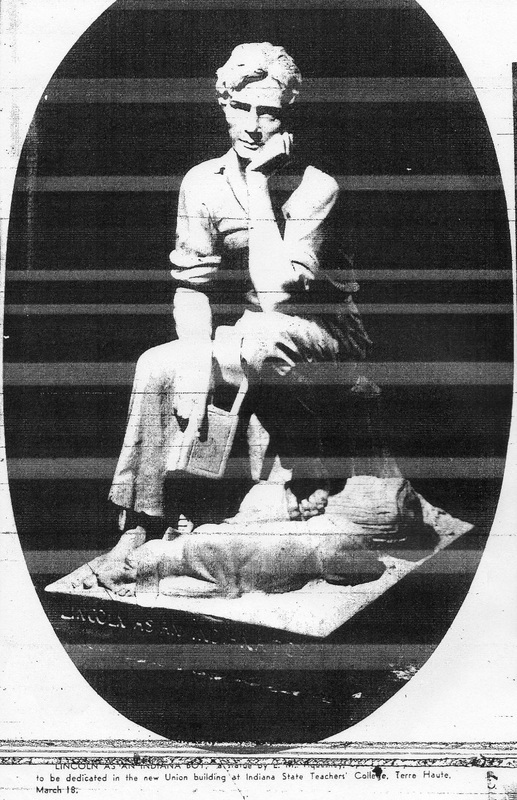 Do you know what happened to Viquesney's Abe Lincoln statue? If so, please tell us. 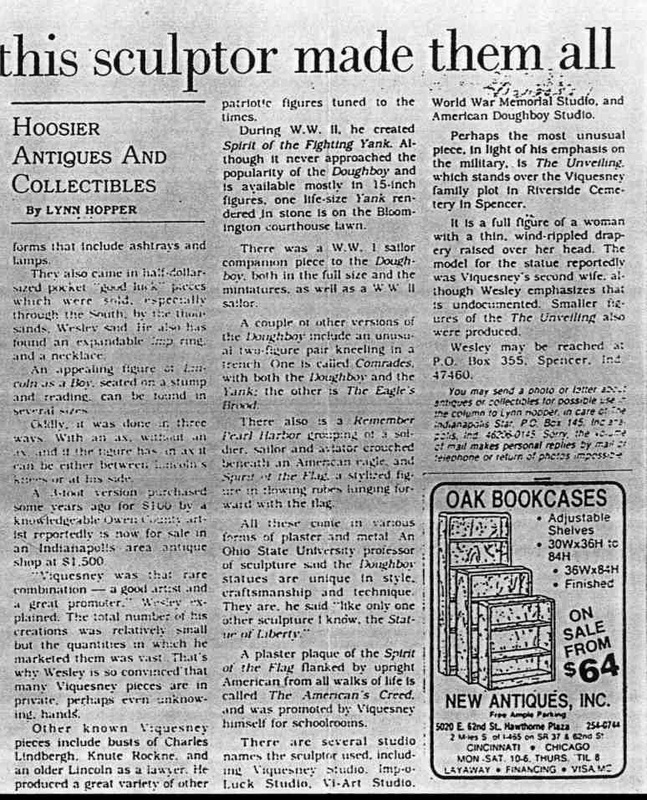 News article supplied by Shirley Tracy, Viquesney family genealogist. Besides the information on the Abraham Lincoln statue, the above article contains a wealth of information on Viquesney, his background, and some of his other works. It may be the last major newspaper article featuring him before his death in 1946. 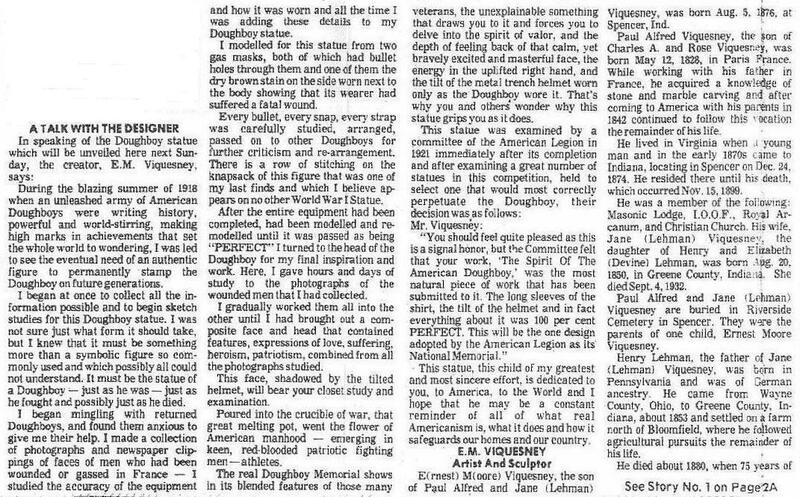 Below, another good general-interest article from the Indiana Star, February 19, 1989, although it does contain errors; there are only 11 (not 13) Viquesney Doughboys in Indiana. The article also states that the statue was "created 80 years ago"; that would put it at 1909, counting back from the date of the article. 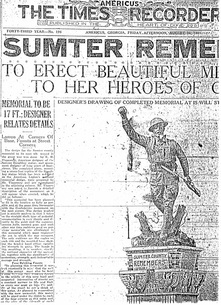 The statue's design was actually copyrighted in 1920, and the first one was finished in January of 1921. 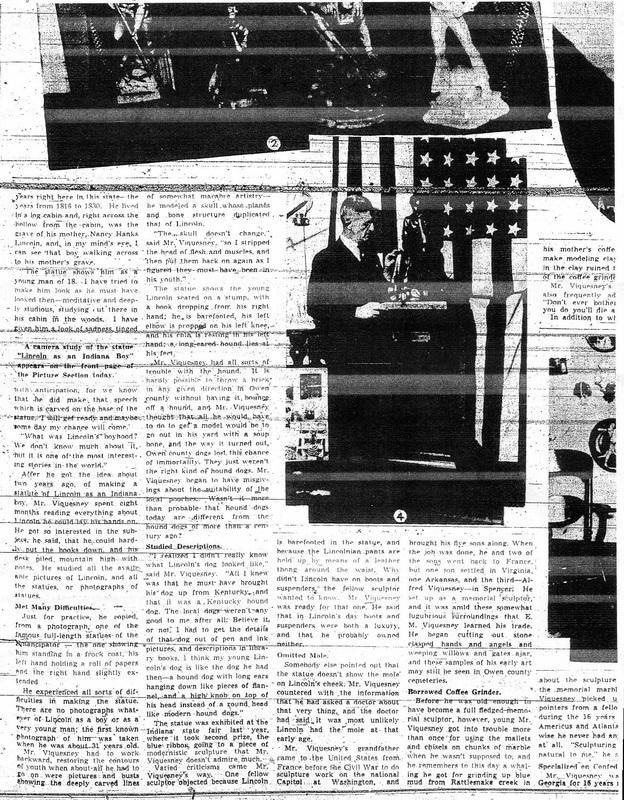 Below, a two-part article that appeared in the Logan [West Virginia] Banner, November 7, 1983, in conjunction with the re-dedication of Logan's Doughboy the following November 11. 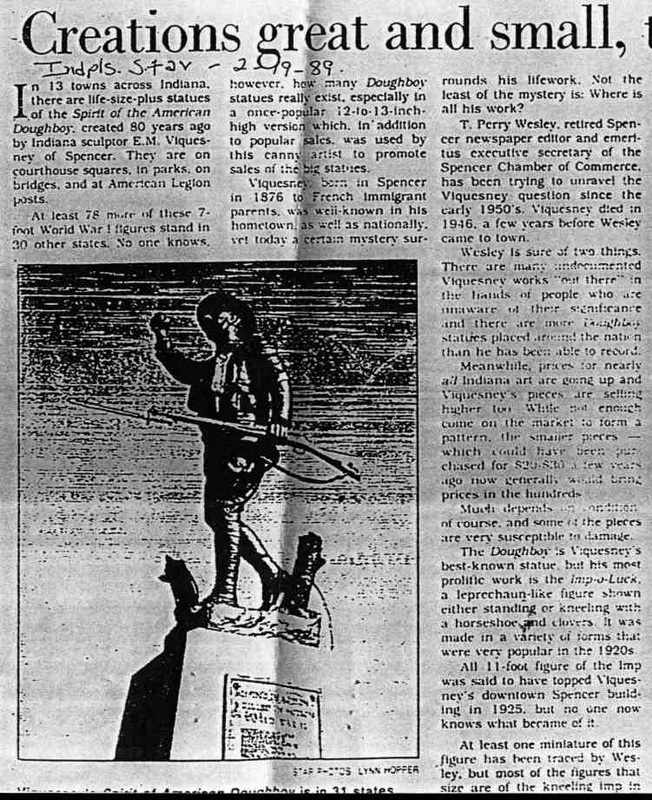 The first part of the article is a reprint of an Owen [County, Indiana] Leader article that appeared in 1927 for the dedication of Spencer, Indiana's own Doughboy and features an "interview" with the sculptor; the second part of the article contains biographical data on Viquesney written in 1983. There are many Viquesney relatives living in West Virginia.